859: Holds 6 pairs of cuffs with a quick retrieval system. Patented clamp allows one hand quick attachment to belt. The holder can be rotated 360 degrees with 16 locking positions. 861: Holds 9 pairs of cuffs with a quick retrieval system. Patented clamp allows one hand quick attachment to belt. The holder can be rotated 360 degrees with 16 locking positions. 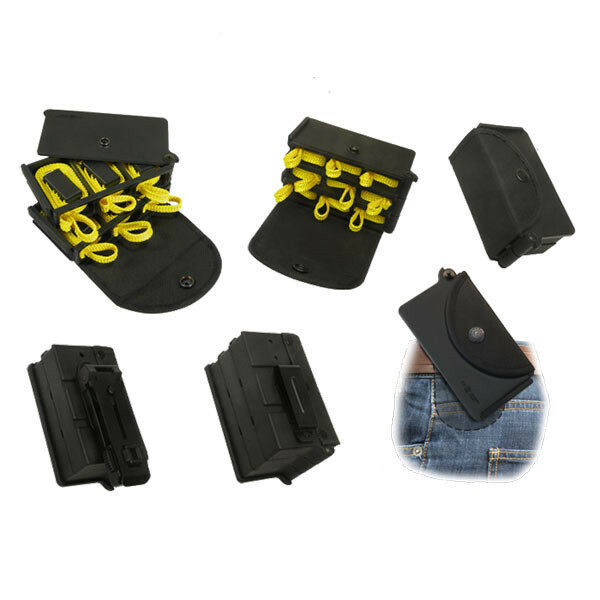 862: Same carrier as the 859 but with a flat, quick coupling clip; attaches to belt with one hand and has a lower profile next to the body, or a MOLLE system. It is capable of 360 degree rotation.